Piranha Fishing: Watch your Fingers! I am a horrible fisherman. It is really boring isn’t it? Yes, it is a great excuse to head out to a beautiful lake around sun rise with a some buddies and have a couple of beers way earlier than you’re normally allowed to, but the hours and hours of sitting there waiting hopelessly for something to bite just doesn’t appeal to me. Now, change the sport a little bit to the point where the bait used is beef, we’re nearly guaranteed a bite every 20-30 minutes, and the catch at the end of the line is a dangerous fish with the capability of chopping off your finger in one crisp bite? Now you’ve got my attention. Piranha fishing in Brazil, is miles more entertaining to me than lake fishing in Canada, but I’ve always been the adventurous type. After about ten minutes of standing on the banks of a slowly flowing river in the Pantanal my arms began to tire of holding the bamboo fishing rod over the water. My mind started to wander, as it always does when given the opportunity, and I started to fall under a category somewhere between bored and annoyed. I have only ever caught one fish in my life, and it doesn’t seem I’ll catch another today let alone one of the famous piranhas. Then it happens. I sense a slight tug to the tension of the line, then another followed by a full pull at my strength. I struggl for a few seconds with a huge smile rung across my face. The water begins to flap and I cry out to the others nearby, warning them to get their cameras ready, bragging that we’ll be eating piranha for dinner. But when I pull the fish from the water I see its flat stomach and its huge whiskers and come to the realization that I’ve caught a catfish, and not even a really big one. In shame I move along the river to a new spot, one that I believe would more likely be frequented by piranhas. I add a large chunk of meat, cow’s heart to be specific, to the hook at the end of my line and cast it gracefully into the moving waters. Time passes and my bad fishing instincts begin to kick in. I drop my line to take pictures of the water, a cayman swimming towards me, and a kingfisher waiting in the trees to swoop down for his own prey. Suddenly a girl just up river from me screams in excitement as she gets a bite. From the water she pulls a fish shaped like a piranha, but what seems to me much bigger. 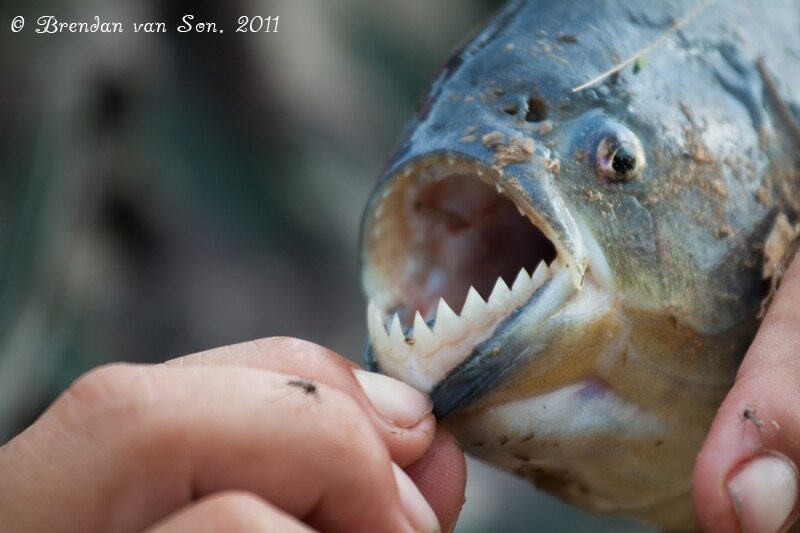 It is in fact a fish from the piranha family, one called the “Pacu” by the locals, famous for being the tastiest of all the fish in the Pantanal. The fish is said to fetch between 20-40 dollars in the nearby markets. Urged by my competitive spirit I stand in complete silence and tranquillity waiting for my own catch. It doesn’t take long. After a couple unsuccessful tugs at the line a fish finally hooks on. As I pull the flopping animal from the waters I am overjoyed to see its massive teeth. I have caught a piranha. The fish is one of the most impressive animals I have ever seen. I always imagined the power and aggressiveness of the piranha one to be over exaggerated. However, as the guide placed a twig a centimetre in diameter between its teeth, the piranha snapped the wood clean in half without even drawing out a single splinter. “He could do that to your finger too” said the guide as he handed me the great fish and instructed me to take the hook out of its mouth. I went on to catch two more piranhas before calling it an afternoon. I am not, by any stretch of the imagination, a hunter nor am I a fisherman. I don’t believe in hunting for sport, to me it seems ridiculous and a method of proving to ourselves that we are more intelligent or stronger than nature, a thought alone that proves that we are wrong. However, hunting and fishing for one’s own nourishment done in a traditional sense and in a sustainable manner is something I can live with. 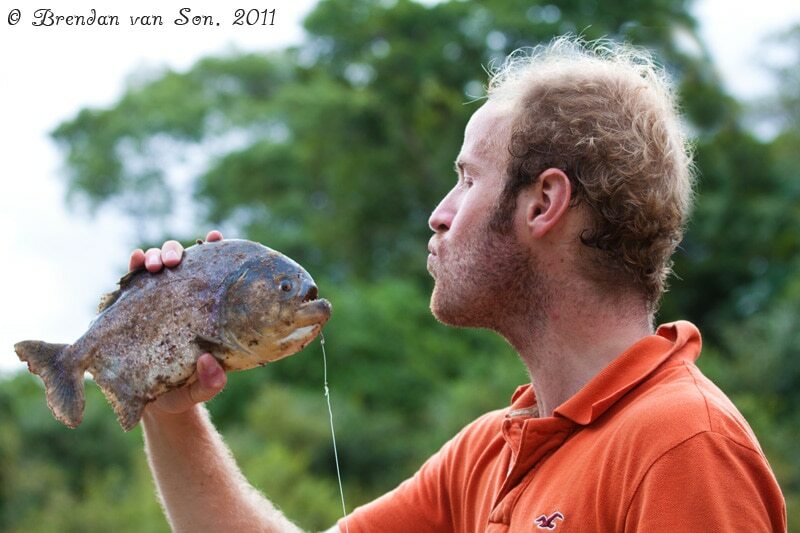 Piranha fishing in Brazil’s Pantanal was one of best experiences I have had in a while. The people that live in this natural playground never go hungry because unlike in the city, all their nourishment is provided to them by the nature that surrounds them. Previous ArticleDo you NEED a Sleeping Bag while Backpacking? Wow that looks fun! Was the fish tasty? How did you remove the hook? But hunting for sport? You might have to be a bit more specific as to what you mean. Most hunters eat what they kill, whether hunting with bamboo fishing poles or high-powered rifles. GREAT photos Brendan! Those teeth are crazy! First of all.. Nice catch! Im a sport fisherman, and i’d like to say, i fish for sport not because i want to prove im better than nature. Its just that i am fascinated by a fish’s behaviour/feeding habits. Thats why i got into fishing. I own a couple of fish as pets and im really drawn into them haha. 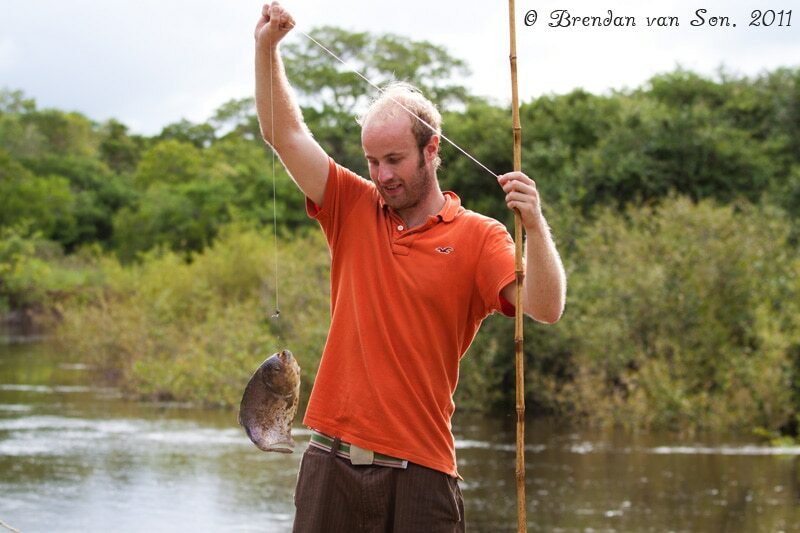 Btw if u ever fish for piranha again, maybe try using a rod and reel so u can cast further. I guarantee u will be pulling piranha after piranha because they hunt in packs of 30+ I love your article by the way. Sweet post! I echo your sentiments on fishing…my dad used to love to fish, it was his time to relax and enjoy the lake and he would come away with massive trout and salmon that we would feast on. When he took me I just scared fish and wished I could cannon ball into the water…but piranha fishing on the other hand! Wow! What an incredible experience! I remember having nightmares as a kid after watching that cheesy B-movie “Piranha” so I’m not so sure I’d want to go fishing for them in real life. There is a new version of Piranha, have you seen it?